Supernatural takes Dean on one last hunt before taking the eternal plunge to the bottom of the ocean as Sam tries to convince him that there is always hope. Episodes like this are awkward as they sit in-between large plot developments and the continuation of said plots. Such is the folly of network television where 23 episodes are ordered as it’s normally more of a scheduling decision than a creative decision. As such the writers have to dream up something for the characters to do for a couple of weeks before getting back to the meat of the story. Supernatural already has placeholders built in by through standard broadly inconsequential hunts though there’s always the question over whether such an episode can be satisfying in the middle of the 14th season. To my mind the answer is yes though I wouldn’t cite this episode as an example that proves my point. If this was truly to be Dean’s last hunt before consigning himself to the bottom of the ocean then it’s really weak as these things go. Mostly because very little happens in that plot beyond a quick investigation before Tony (Nick Hunnings) is consumed by his guilt and kills himself. The conversation with Alan (Josh Collins) suggests that this could be a story about dealing with losing a brother as this is very pertinent to Sam but it ends up being a fairly simple scene designed to move the plot along. Tony is a bit more interesting in that he is blinded by the visions he receives causing him to believe he is acting on the word of God. He actually is doing that as he has been appointed as the next Prophet but the fact that Donatello is still barely alive means that his is a malformed Prophet driven insane by the visions he receives which presents a choice in front of Sam and Dean. Donatello being alive guarantees that other malformed Prophets will appear so the only way to prevent that is by deactivating the machines keeping Donatello alive. The episode doesn’t take the time to debate the merits of euthanasia as by keeping Donatello alive with no objective quality of live Sam and Dean have made it clear that it isn’t something they believe in. The episode could have done more to show the weight of the choice they were now making. Dean sounds regretful when he points out that there is only one way to stop more psychotic Prophets from appearing but beyond that it isn’t really discussed and is entirely mitigated when Cas realises that there is a possibility of bringing him back. This might seem like a cop out and on one level it is but it’s designed to tie into Dean feeling that there is no hope to save himself and stop Michael by proving that even the most hopeless situations aren’t devoid hope. It’s a simple and heavy handed lesson but it gets the job done and makes Donatello a source of information once again which might end up being the key to finding a solution. There are a lot of conversations between Sam and Dean in this episode about the decision Dean has made and they do start to get repetitive after a while. Sam pointing out that Dean sounds like he’s making “death bed apologies” which is certainly dragging his mood down while setting a morbid tone for the episode. 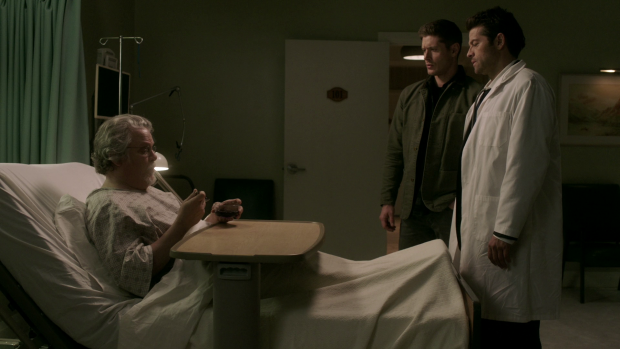 Dean essentially runs the gamut of regrets that he has by apologising for making Sam feel as if he was taking their father’s side when they were young as an example. It’s rare to see Dean so defeated and Jensen Ackles plays it well. Jared Padalecki also delivers an excellent performance in the final scene where he lashes out at Dean for giving up when they should be focused on finding a solution to the problem. He even hits Dean to get the point across before collapsing into a hug. It’s a really moving brother to brother scene that changes Dean’s mind and gets him back on the path to defying the odds. As good as this is it feels like a bit of a cop out in a lot of ways as Dean goes from being fully committed to his self sacrifice to willing to try alternatives in an unreasonably quick time. It does nothing to convince the viewer that this episode is to do little more than kill time until the rest of the season can get underway. 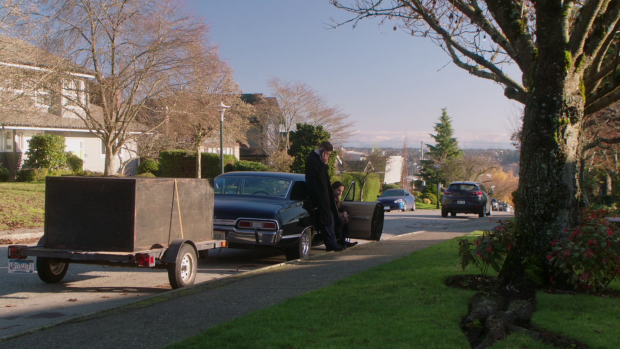 Having the box be dragged around by the Impala is a really interesting choice as it acts as a visual representation for the issue weighing them both down. It’s always there following them and can’t be ignored. The box has physical weight to compliment the emotional weight and it means something different to both Sam and Dean. For Sam it represents the fact that Dean has given up and for Dean it represents the fate that he has resigned himself to. In order to move on they both have to find a way to shed themselves of that weight and the episode is largely about them doing that. Nick’s escape from the hospital was pretty much in keeping with how this character has been so far. It’s believable that he could be so casually manipulative that the police officer could be caught off guard by his perceived weakness. As with everything else in this episode it feels like Nick’s contribution is another example of wheel spinning. Now that he has avenged his family there is the business of Lucifer to get back to but it appears the the show isn’t ready to pull the trigger on this yet. Instead we have him haunted by his wife Sarah (Jaycie Dotin) in their former home. She can’t move on because she is tethered to the house by Nick’s obsession with Lucifer. The key to her moving on is for Nick to reject Lucifer but this is something he can’t bring himself to do because of everything that connects him. His decision to leave Sarah tethered to their old house proves that his quest for revenge never had anything to do with getting justice for his family and everything to do with his own unrelenting bloodlust. He resolves to actively seek out the darkness because that will bring him closer to Lucifer and hopefully it won’t take too long for that to happen. The appearance of Sarah opens up a raft of possibilities in this ongoing plot. It could be that Nick’s connection with Lucifer will have her attached to it. I doubt the return of Lucifer will be the end of Nick so it makes sense to have something continually tethering him to his humanity in the form of Sarah’s ghost. There has been too much work done on Nick to have him simply replaced by Lucifer and Sarah’s appearance is definitely something that relates almost entirely to him. Sarah seems to be an interesting character so far and Jaycie Dotin’s chemistry with Mark Pellegrino is very watchable so there’s a lot to play with here. A solid if unremarkable episode that boasts some engaging character beats but ultimately feels like a placeholder before the rest of the season kicks in. Sam and Dean have a lot of meaningful conversations as they make their way to send Dean to the bottom of the sea. As they progress Sam grows more and more frustrated until he finally breaks down and convinces Dean not to give up. This all feels very abrupt and does nothing to convince the viewer that this episode is doing anything other than killing time. Jensen Ackles and Jared Padalecki perform their roles wonderfully which does salvage some of the placeholder plotting but it’s still clear that we’re awaiting the point where things can move on. The idea of a psychotic Prophet coming into being because the prior one is near death is an interesting idea that the episode doesn’t do much with. 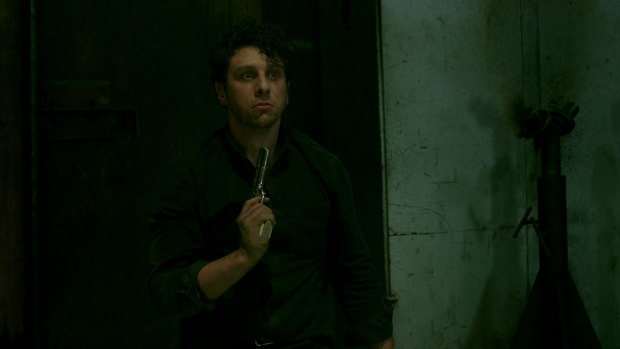 Tony quickly sees the error of his ways and kills himself leaving Sam and Dean to decide whether they let this keep happening or turn off the machines keeping Donatello alive. It turns out that Cas can save him so no hard choices need to be made which proves that there is still hope in the most hopeless situations. It’s heavy handed but gets the job done and possibly allows Donatello to provide an alternative to Dean dooming himself. Nick’s escape from hospital and subsequent haunting by his wife Sarah confirms that his desire for revenge didn’t really have anything to do with his family. It’s clear that Lucifer has changed him on a fundamental level and he can’t renounce him even though it would allow Sarah to move on and be at peace. Instead he decides to embrace the darkness and go looking for Lucifer which is basically the opposite of what Sarah wants from him. Sarah’s continue presence suggests that she will have some part to play when Lucifer returns as there has been so much work done establishing Nick as a character that it wouldn’t make sense to have him replaced by Lucifer. There’s lots of potential here and hopefully the writers will make good use of it. Sarah seems like an interesting enough character for the moment and Jaycie Dotin’s chemistry with Mark Pellegrino is really good so I’d be interested in seeing them interact more.